Located beautifully beside the Jimbaran Bay, the Four Seasons at Jimbaran is designed to reflect a traditional Balinese village. 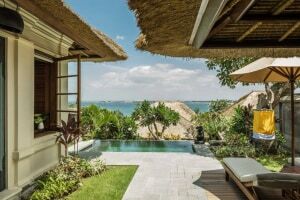 Spread across 35 acres, guests at Four Seasons at Jimbaran have direct beach access with all the villas also housing their very own swimming pools along with a private garden. With a five-star designated and listed in the 2015 Condé Nast Traveller Gold List, Four Seasons offers a cultural experience with their varied tours and activities. 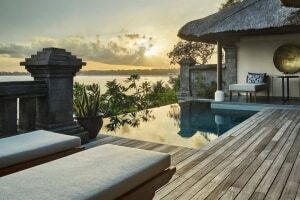 Offering four dining options serving mostly Asian cuisine and two swimming pools, Four Seasons at Jimbaran also houses the Healing Village Spa and Ganesha Cultural Centre, designed to indulge guests in Balinese tranquillity. 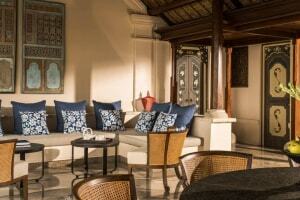 Renowned for its extravagance, the Four Seasons at Jimbaran will not fail to impress its guests. 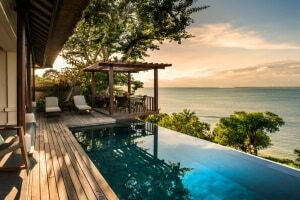 Literally translating into ‘beautiful’ in the language of Sanskrit, Sundara is an all-day lifestyle experience located on Jimbaran Bay, renowned as Bali’s most exclusive stretch of sand. 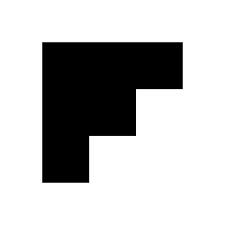 Being a beachfront hotspot, Sundara is a lazy beach club by day and an iconic restaurant at night. With the perfect mix of class and relaxed vibes, Sundara also houses a swimming pool right beside the beach and a private cabana. It serves Modern Asian Cuisine. Located beside the infinity pool, this open-air café offers a light and casual menu to enjoy with ocean breezes and breath-taking views of Jimbaran Bay. Shaded tables are an appealing option on the warmest days. They have a special children’s menu for kids and also offer international favourites such as salads, sandwiches and more. The Pool Terrace Café also offers vegetarian and gluten-free options. Served with traditional hospitality, the Cooking Academy offers authentic Balinese cuisine with daily dishes and special dishes that are usually reserved for festivals or occasions. The Cooking Academy only accommodates 28 people in one sitting and is highly recommended to experience the local culture and cuisine of Bali. For drinks and relaxation, head to Four Seasons’ Terrace Bar and Lounge which is an open-air lounge, where two Balinese-style pavilions welcome you with comfortable seating and panoramic views of Jimbaran Bay. With a location right next to the Taman Wantilan restaurant, this is the perfect spot for cocktails before or after dinner. The Terrace Bar and Lounge also offers vegetarian options. Offering beautiful views of lush greenery and the shimmering Indian Ocean, Taman Wantilan Restaurant is one of the perfect options for breakfast at Four Seasons by Jimbaran Bay. Originally serving Asian cuisine, Taman Wantilan also serves a few American dishes if requested and houses a small pond, adding to the beautiful ambiance. Taman Wantilan is currently going through renovation and will be under enhancement till April 2018. Inspired by its beachside garden setting atop the Resort’s seven villages, the Healing Village Spa draws on Balinese traditions and nature’s resources to nourish and heal the physical body, opening a harmonious path to inner change. Grounding treatments, natural therapies and vibrant rituals pay a tribute to Bali’s colourful culture and evoke a sense of warmth and connectedness. Merging seamlessly with the waters of magical Jimbaran Bay, the Infinity Pool is set on a spacious stone terrace with enough space for lounge chairs and umbrellas. The quiet ambience is ideal for adults while the attendants offer complimentary amenities, such as ice cream, fresh fruits, water, cold towels and sunscreen. You may also request refreshments and snacks from the adjoining Pool Terrace Café. The Sundara Beach Club also houses a swimming pool. There will be no lifeguard on duty during service hours. For beach lovers, the Coconut Grove beach retreat is a spacious, secluded setting reserved exclusively for Four Seasons guests. Relax on comfortable lounge chairs to enjoy the sun or the leafy shade of palms and other tropical trees. Open-air gazebos with daybeds are tempting for afternoon naps or if you're feeling active and adventurous, this is the perfect place to enjoy our range of water sports activities. With a hard court in place, guests can practice tennis and develop their skills with the many training programs offered by Four Seasons at Jimbaran Bay. Guests are also offered complimentary racquets, balls and shoes for their game. Kindly wear comfortable clothes and shoes for a hassle-free experience. Keeping fit at Four Seasons Resort Bali at Jimbaran Bay is a possible with the state of the art fitness centre complete with a sprung floor aerobics studio, free weights gym, and cardiovascular machines with individual TV monitors. Along with group yoga and personal training programs, experience ultimate body wellness by the sea. Ganesha Culture Centre is an interactive space dedicated to workshops in Balinese art, music and crafts. The centre’s primary purpose is to support local artists to preserve and celebrate Bali’s heritage as the only remaining Hindu civilization in Indonesia. The rich culture of Bali permeates every aspect of daily life, architecture and art, and visitors are invited not only to observe, but to participate in rituals, ceremonies and cultural activities. Open for children from 4 to 12 years old, the Jimba Club offers fun, discovery and entertainment. Every day features a different theme – from “Pirates of Jimba” and “Master Chef” to the “Castaway” beach day. The Jimba Club provides a safe and welcoming place for young guests to relax, celebrate the gentle Balinese culture through interactive activities, and most of all, have fun. Jimba Club also offers babysitting services at additional charges. · Jimba Club also offers babysitting services at additional charges. 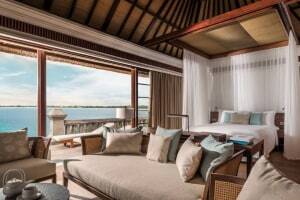 Four Seasons at Jimbaran has non-smoking rooms. However, it does have a designated smoking area. Child age: 0 to 18 years. Children under 3 years of age stay free of charge while using a cot/crib. Children under 13 years stay free of charge while using an existing bed. Adults can use an extra bed for an additional charge of IDR 1,633,500 per person per night.